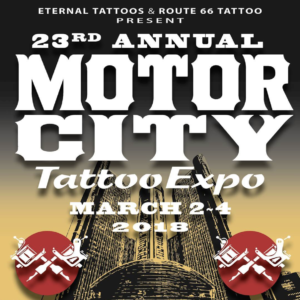 Come join us at the 23rd Annual Motor City Tattoo Expo at the beautiful Renaissance Center in Detroit! We will have a double booth and some of our artists are still booking spots to get tattooed at the expo, so contact the shop for any questions or to book some time to get tattooed at the expo! The expo is from March 2 to March 4. Doors are open on Friday, Noon-11pm, Saturday, 11am-11pm, and Sunday, 11am-7pm. Tickets are sold at the door. Stop by and see some amazing artists from across the country! Previous post We Have A Piercing Apprentice!